In a large pot over medium-high heat; brown sausages on all sides. Remove from heat; set aside. Heat oil; add onion, garlic and seasonings; sauté 5 minutes. Cut sausages into 1-inch pieces. Add sausages, tomatoes, paste, wine and butter to pot. Reduce heat; simmer 1 hour. Cook spaghetti according to directions. 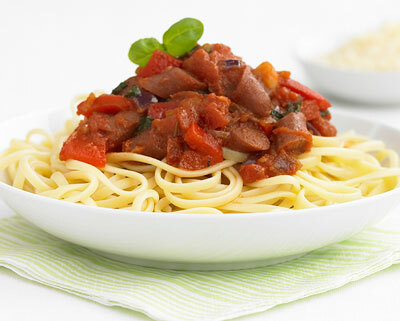 Serve sausage and tomato sauce over cooked spaghetti. Enjoy with a glass of Jacuzzi Aglianico. Aglianico is an ancient variety that was thought to have been planted in Southern Italy in Campania and Basilicata in the seventh century B.C. The name is derived from “Hellinica” which means “Greek” providing a clue to its origins. Jacuzzi’s Aglianico is grown in a Paso Robles vineyard shadowed by Black Mountain. 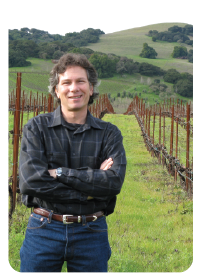 The vineyard receives less than 11 inches of rain per year and is influenced by cool air due to its proximity to the Pacific Ocean. The Aglianico grapes are handpicked and de-stemmed without crushing. This is a very gentle process that minimizes the pick-up of bitter components from the skins and seeds. The fermenting wine is tasted daily and once the desired tannin level is achieved the wine is pressed using our low-pressure “tank press”. This entry was posted in Recipes and tagged Aglianico wine, food pairing, paso robles wines, recipe, sausage pasta, spicy sausage recipe, wine, wine club, wine pairing, wine tasting, winestyles. Bookmark the permalink.